In my last post I showed you how I combined polystyrene disks and felt to make some really yummy looking faux mini gâteaux. But what would a cream sponge cake be without a strawberry on top? 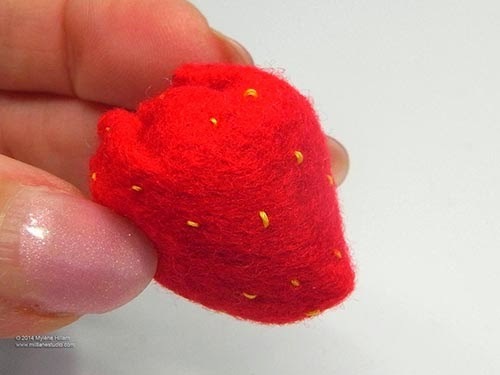 So today, I'm going to show you how easy it is to make strawberries from felt. 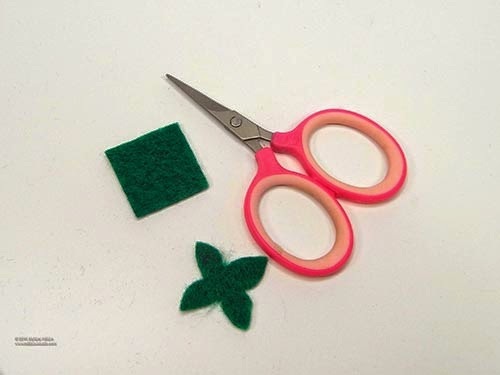 All you need is red and green felt, yellow and green thread, stuffing, a needle, a sewing machine and scissors. 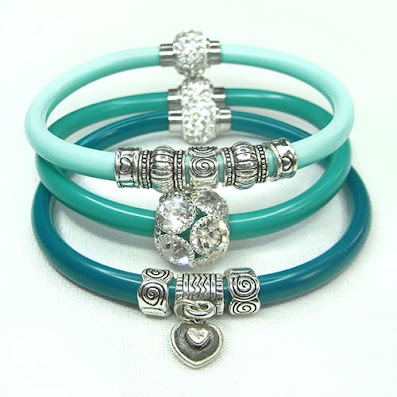 You'll also need something round to trace around. 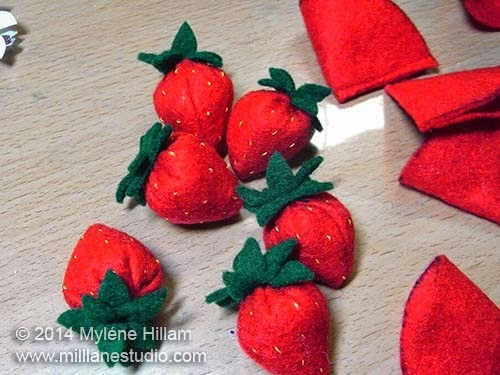 I used a ribbon spool - the perfect size for lifesize medium strawberries! 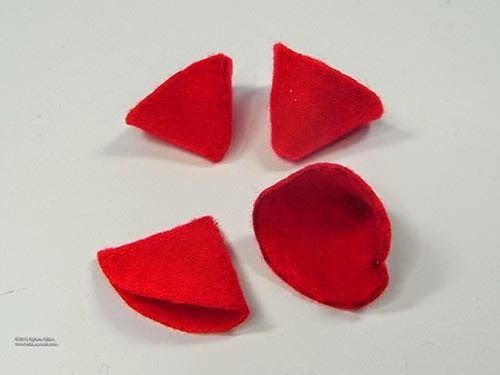 Begin by tracing the circle onto the red felt. Use a permanent marker so you can easily see where to cut. Cut out the circle, fold it in half and then cut on the fold line. You now have two semi circles. Fold each of these in half and then stitch the straight edge. You can see that I've just stitched a bunch of these semi circles and left them joined. I just cut them apart as I'm ready to make them. Once you've separated them, turn the seam to the inside. Fill the cone with some stuffing. Thread the needle with yellow thread and stitch a running stitch all the way around the top edge. 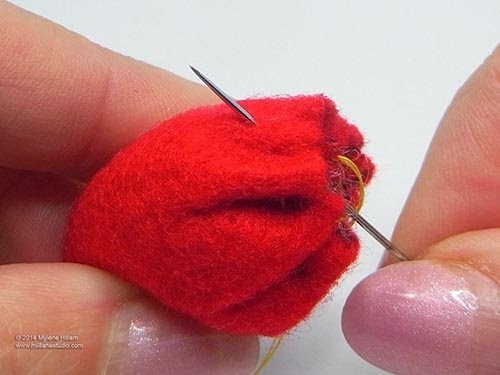 Pull the thread tightly to enclose the stuffing and tie off the thread in a secure knot. 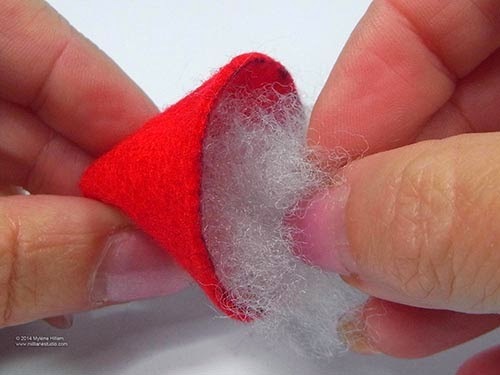 There's no need to trim away the thread... you can continue using it in the next step. 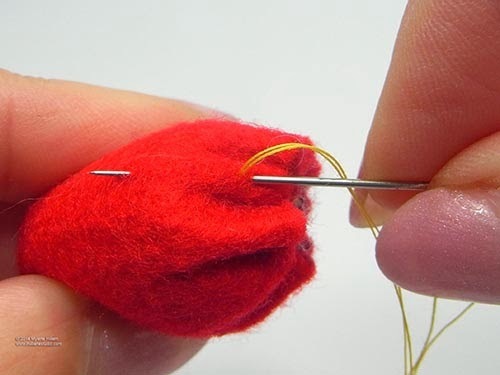 Insert the needle through the stuffing and exit amongst the gathers near the top. 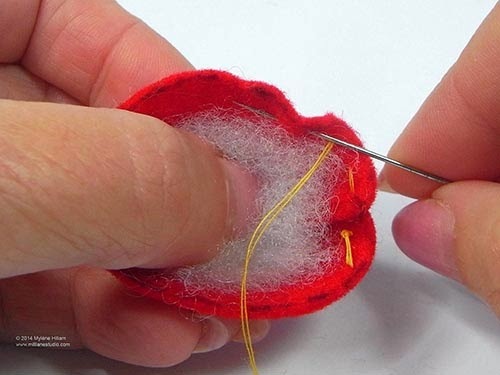 Create a small backstitch by inserting the needle back into the felt approximately 2mm above where the needle exited from the previous stitch, Exit the needle approximately half way down the strawberry. 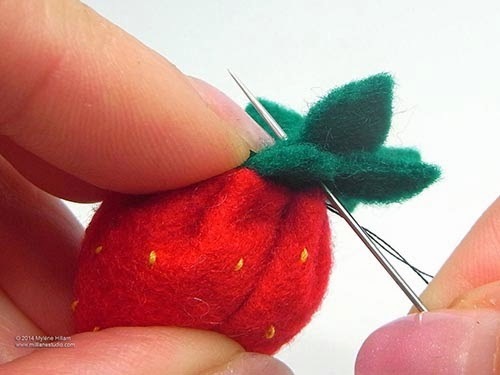 Continue adding backstitches all over the strawberry and then tie off the thread. 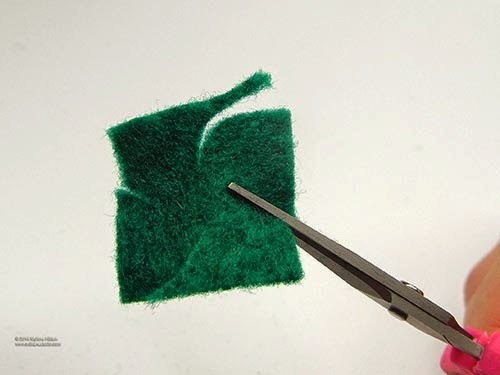 Cut two 2cm squares of green felt. 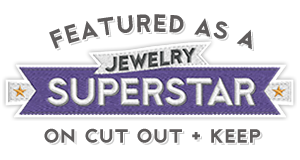 Beginning at one of the corners, cut a curved line towards the middle, stopping before reaching the centre. Turn the square around and repeat on the remaining corners. Flip the square over and repeat on the other sides of the corners. You should end up with a four "petalled" leaf. Repeat with the second square of felt. Thread the needle with green thread. Place the two leaves on top of each other, offsetting them, and insert the needle through the centre. 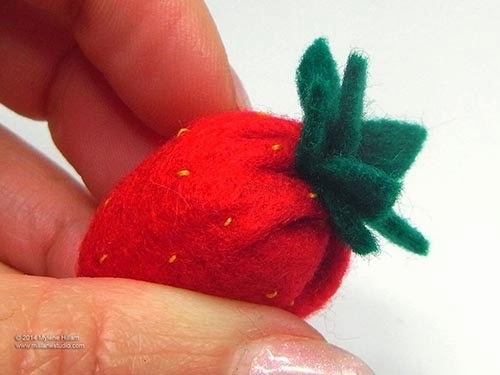 Place the leaves on top of the strawberry (with the knot underneath) and stitch back through the leaves and into the top of the red felt. 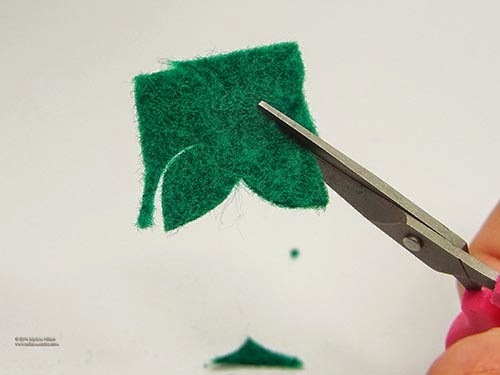 Draw the needle back up to the top through the green felt and pull tightly. Insert the needle back through the leaves and into the strawberry on the opposite side. Continue all the way around the strawberry until the leaves are secured and the gathered edge of the strawberry is covered. 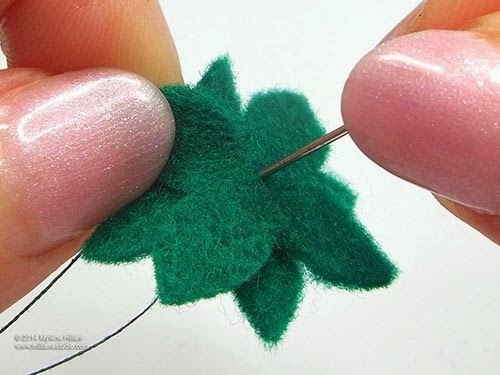 If you pull the thread firmly as you go, you will add some dimension to the leaves and they will sit upwards. Tie off the thread and trim it away. Tada! How easy was that! Why not make a bunch of them and decorate a mini gâteaux like I did - they are so realistic that you'll have everyone drooling over your faux gâteau!